In this lab, you will be applying what you know about input devices, output devices, mechanics, and serial communication to invent a new musical instrument. Consider the input and output space we have learned about so far. 5. Keyboard/mouse/etc – using serial communication to read input from the computer and send it to Arduino. Some materials will be available in class (e.g., balsa wood, foam core, some metal etc). Also consider different materials in your environment including materials that can be found in your recycle bins. 1. Work in teams of four. 2. 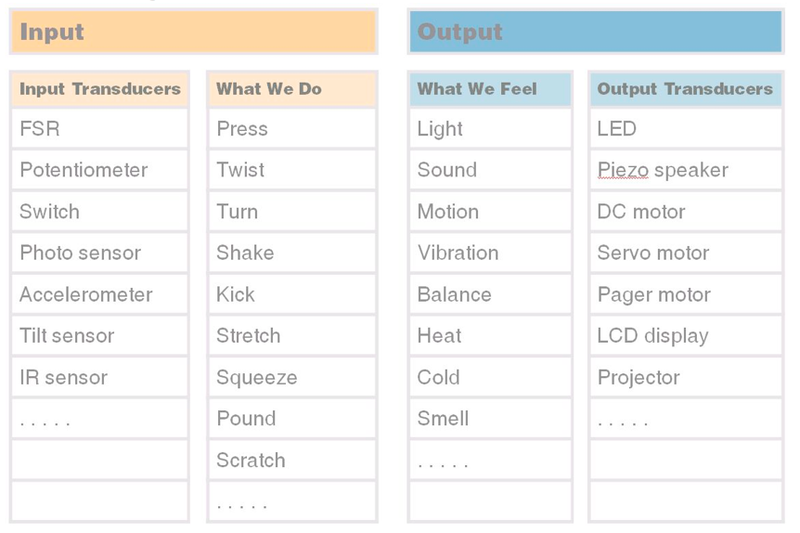 Build an instrument that produces sound (and, optionally, visualization) in response to physical manipulation. 3. The instrument should use at least 4 inputs devices. The devices can be all the same, all different, or any combination in between. 4. Consider a collaborative (or competitive) aspect of your instrument. For example, it may support multiple people using it at the same time to play the instrument. 5. In addition to how input is read and output is generated, we will be looking to see the mapping between the input and output space. Finish your instrument. Post descriptions and photos (and/or video) of your instrument on the course website.